CIAS '15 report and photos by Ron Cembrowski from Toronto-Pearson International Airport (CYYZ), staging base for the airshow's jet display teams, including the Breitling Jet Team, plus the Sea King 1963-2013 special. Each year the Canadian International Air Show (CIAS) takes place on the September Labour Day long weekend. 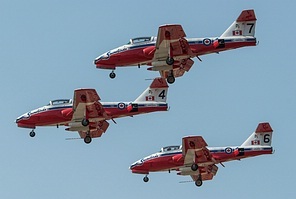 In existence for over 65 years, the CIAS is Canada's largest and longest running air show and is the third largest air show in North America. It is estimated that over 1.4 million people watch the show annually. The flying display is over Lake Ontario, on the Toronto waterfront, directly south of the Canadian National Exhibition (CNE) grounds. Warbirds and civilian aerobatic acts stage out of Billy Bishop Toronto City Airport (CYTZ) and military aircraft and jets stage out of Toronto Pearson International Airport (CYYZ). The photos in this report are from the Media Day activities held at Toronto Pearson FBO Skyservice Avitat on the Thursday before the air show weekend and of participating aircraft staging out of Pearson on approach to Rwy 24R as they returned from the Toronto waterfront during the air show weekend. An always fun photo opportunity, held during Pearson Media Day, was the traditional water canon salute courtesy of Toronto Pearson Emergency Services, for the arriving CF-18 Demo Hornet pilot. There are also photos taken mid-field of the CH-124B Sea King doing an impressively tight fly around of the main Control Tower. This particular Sea King, based at 12 Wing CFB Shearwater, NS, was painted in special colours commemorating 50 years of Sea King service (1963 - 2013). Media Day also gave me the opportunity to photograph some of the military demonstration teams that performed at this year's show. Both the U.S.A.F. Air Combat Command F-16 Viper Demonstration Team, from Shaw AFB, SC and the U.S. Navy F/A-18C Hornet Demonstration Team, from VFA-106 in Oceana, VA were present on the ramp. In addition, the F-16 Viper was featured in the rare USAF Heritage Flight along with the P-51D Mustang "Baby Duck" as part of the air show weekend flying schedule. The Mustang staged out of Billy Bishop Airport and was not present at the Thursday Media Day. It was a great pleasure to see these highly sought after U.S. Demo Teams here. We don't get them often enough! Another special treat was the European Breitling Jet Team, featuring seven L-39 Albatros jets, who made the CIAS one of their 2015 American Tour exclusive venues. No Canadian air show is complete without the appearance of the CF-18 Hornet Demonstration Team and of course Canada's icons of the air, the Canadian Forces Snowbirds. The Snowbirds never fail to impress and always close the show out as the final scheduled act. The CF-18 Demonstration Team was to fly the beautifully painted CF-18 Hornet. The 2015 special colour scheme commemorated the 75th anniversary of the Battle of Britain. Unfortunately, due to technical issues the aircraft did not fly during the air show weekend and a regular grey Hornet from 3 Wing (Bagotville) was used as the backup. Still, it's loud, it's fast, and it's a Hornet! 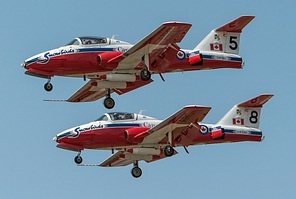 Civilian aerobatic acts, flying from Billy Bishop Airport during the air show days, included the high performance flying of Mike Wiskus and the Lucas Oil Pitts Special, John Klatt and the Screaming Sasquatch Jet Waco, Super Dave and the Scheyden MX2. As well, the Royal Canadian Air Cadets put on a demonstration with a Bellanca Scout and a Schweizer SGS 2-33 Glider. These are the aircraft used in the Cadet Flight Training Program. Central to the air cadet program is an opportunity for cadets to earn a gliding or flying scholarship. It is still one of Canada's largest youth organizations. The 2015 show was held from Saturday September 5 through until Monday September 7. The flying displays began at 12:00 PM and ended at around 3:00 PM each day. The 2016 Canadian International Air Show is being held on September 3-5. For more information please visit the Canadian International Air Show website.